The M1575HCT-15A-SMA from Maxtena is a high performance active GPS antenna. This dual stage LNA active antenna is designed for the GPS L1 band, and built on Maxtena proprietary Helicore™ technology – a technology providing exceptional pattern control, polarization purity and high efficiency in a very compact form factor. The M1575HCT-15A-SMA is a screw-on design, featuring an integrated SMA connector. Ultra light in design, the M1575HCT-15A-SMA is rated IP-67 when mounted and unmounted for added protection and includes an internal O-ring. 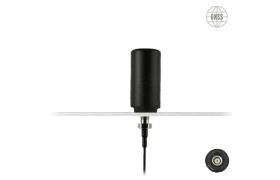 This product is ideal for applications requiring high quality reception of GPS signals.